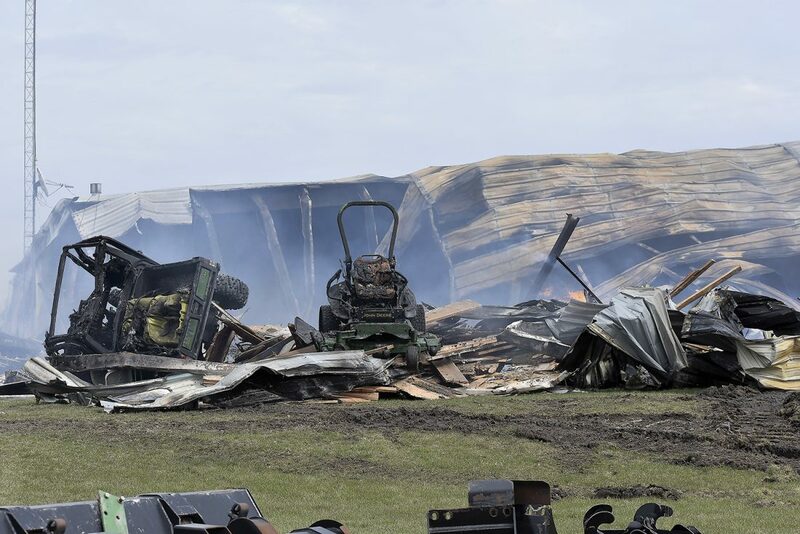 John Deere equipment lies in ruins Monday afternoon after a fire tore through a K.C. Nielsen dealership facility in Manson on Sunday. MANSON — A massive fire that left a K.C. Nielsen John Deere dealership in ruins Sunday hasn’t deterred owner Tony Nielsen and company employees. As the fire still burned within the estimated 280-foot-by-120-foot structure on Monday afternoon, dozens of employees were busy building walls, hauling rock, and moving supplies to other facilities on the property, 215 S. Eighth St.
About 15 people work at the Manson dealership. Employees from other K.C. Nielsen branches also came by to assist. 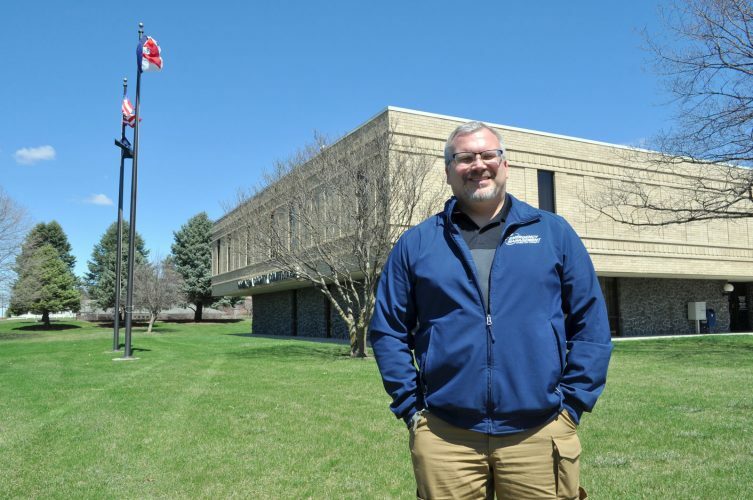 Jeff Kampen, sales personnel at K.C. 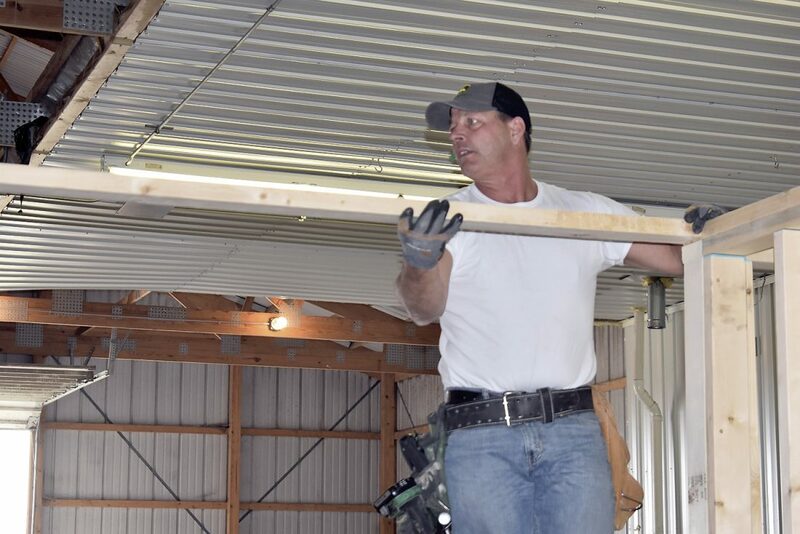 Nielsen in Humboldt, gets to work helping to build walls for an office in another facility on the property of K.C. Nielsen in Manson Monday afternoon. Dozens of employees were busy helping the dealership reopen for planting season. The dealership plans to be open for business by Wednesday morning, he said. Parts will be sold out of another building on the property. “We are putting up walls for offices,” Nielsen said. The efforts to continue operations began just hours after fire engulfed the main building. The fire was reported at about 3:37 p.m. The K.C. 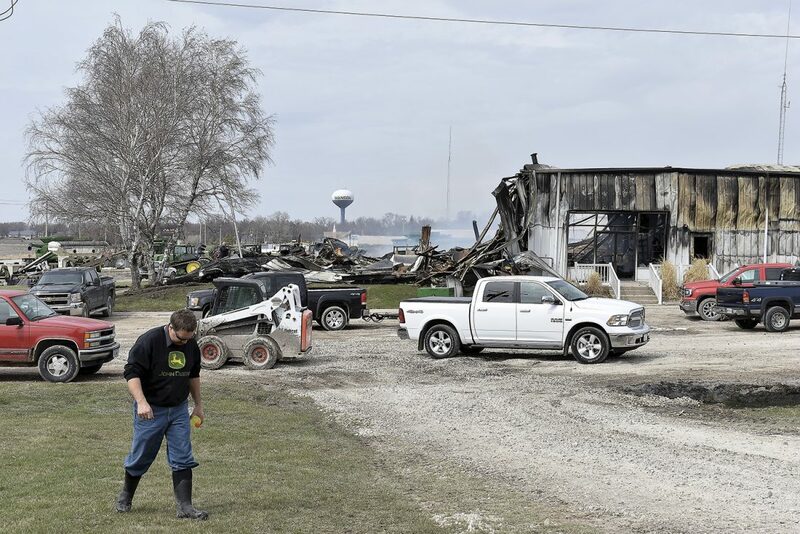 Nielsen John Deere dealership in Manson was destroyed by fire on Sunday. The fire was caused by sparks from an employee using a grinder in the shop area, according to Dave Anderson, Manson assistant fire chief. Contents of the building included customer tractors and equipment, new lawn and garden equipment, tools, and new parts inventory. Sales offices were located in the front portion of the building. Parts and equipment that was being repaired were housed in the back. Anderson was hesitant to provide an assessment on the value of property lost, but he said based on the price of equipment stored in the structure, that number is likely in the millions. A K.C. Nielsen employee walks toward another facility on the property of the Manson dealership Monday afternoon. 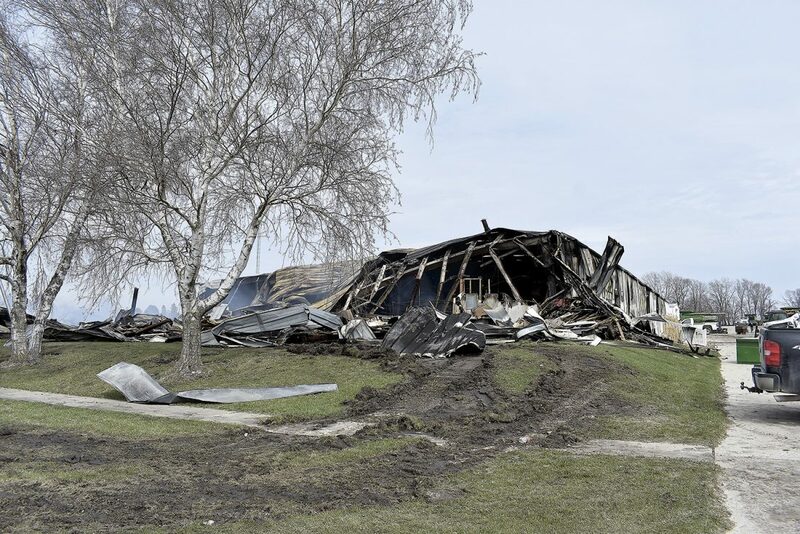 The approximately 280 foot-by-120-foot structure shown behind was destroyed by fire on Sunday. 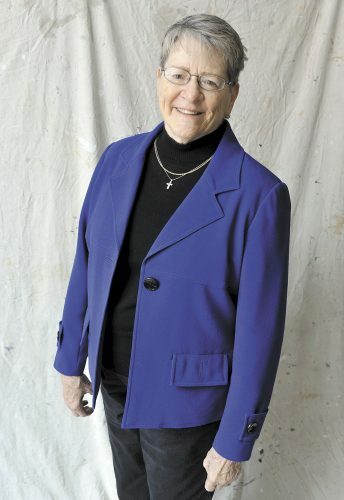 Nielsen, who has owned K.C. 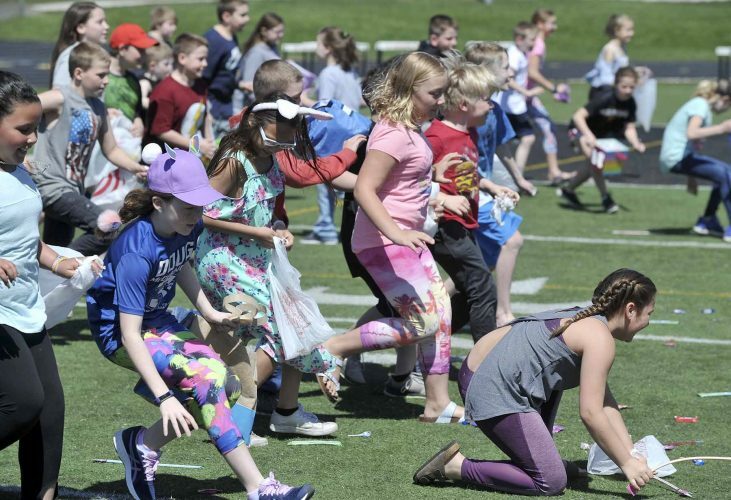 Nielsen since 2001, was first notified between 3:30 p.m. and 4 p.m. Sunday, he said. He was about an hour and a half away on business. When he got there, the building was completely engulfed. 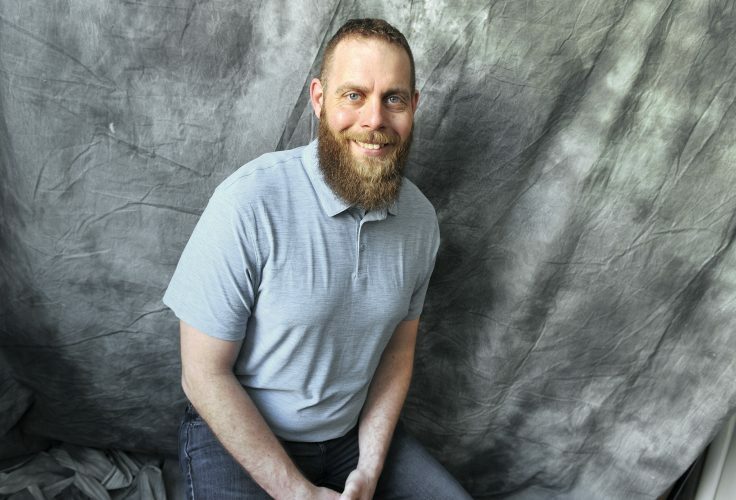 Justin Grossnickle, a technician at K.C. 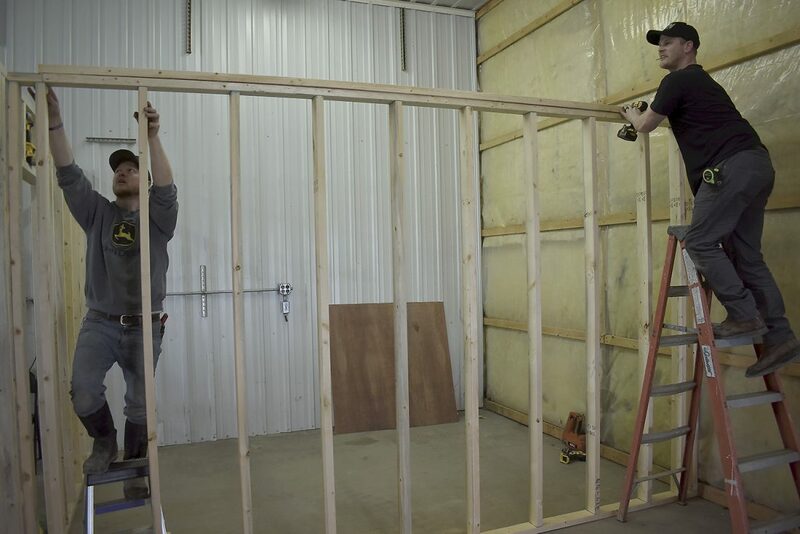 Nielsen in Manson, left, and Chet Freimuth, a parts specialist at the dealership, work on putting up a wall in a separate structure from the one that was destroyed by fire. The dealership is hoping to be open for business by Wednesday. 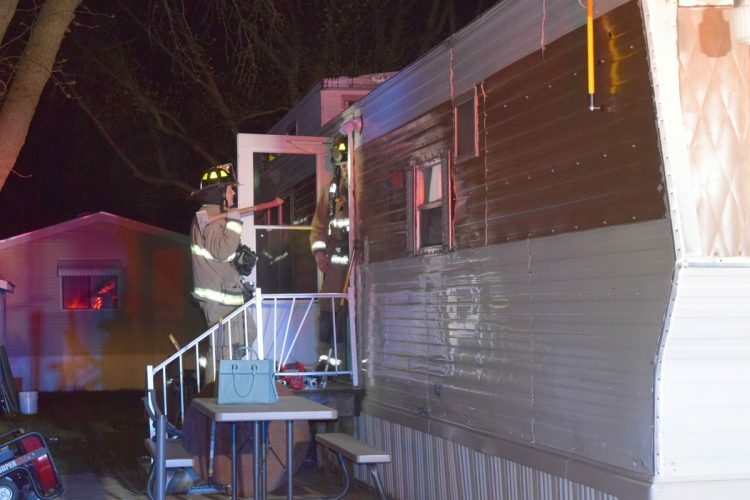 Firefighters from 11 volunteer departments responded, including Manson, Lohrville, Rockwell City, Fonda, Lake City, Palmer, Pomeroy, Knoke, Jolley, Knierim and Lytton. The hazardous materials response team operated by the Fort Dodge Fire Department was also on scene. “Mayor Matt Bemrich and (Fort Dodge Fire Chief) Steve Hergenreter were offering any kind of assistance that they could and that’s huge in small town,” Anderson said. Nielsen appreciated the efforts of first responders. Nielsen said a combine shop near the fire-damaged structure was left untouched by the flames. “The reaction from the fire departments was awesome,” he said. One firefighter had to have stitches put in his hand after suffering an injury battling the blaze, according to Nielsen. “He got hit with something after entry,” Anderson said. “But he is home and doing well. Firefighters continued to monitor the fire on Monday, but are letting it burn out on its own. Grossnickle was among the employees building walls in the other shop. Grossnickle said he lives about 5 miles north of the dealership. When he first heard about the fire, he didn’t believe it. But when he got in his vehicle to drive to the dealership and saw the smoke, he suspected the worst. Many of the tools Grossnickle uses were lost in the fire. Nielsen credited his employees for taking the loss in stride.